Offers: See club website for detail of any prevailing offers. The Grand Bear Golf Course, designed by Jack Nicklaus and opened in 1999, is a championship length, 18 hole, Par 72 golf course which forms the centrepiece of a semi-private golf resort set on the sourthern edge of the De Soto National Forest. Cut out of the native pine forest between the Biloxi and Little Biloxi Rivers the course is laid out as two large loops of nine holes (one to the south of the Clubhouse, one to the North). This layout, with fairways meandering through towering pines and past cypress wetlands gives the course a sense of complete solitude which is rare and a real treat. However, the Nicklaus trademark of deep bunkers and huge undulating greens means concentration is needed if you are to score well. The course is over 7,200 yards off the back tees for a Course Rating of 75.5 and Slope of 143 and so can easily test the best golfers. However, the use of multiple tee positions means than this fantastic Jack Nicklaus design can be enjoyed by golfers of all ability. 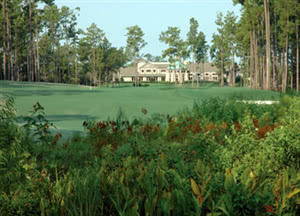 With Bermuda grass throughout the course is always immaculately maintained and the staff are professional and friendly. Visitors are welcome, contact the club to make arrangements. Beautiful layout by Jack Nicklaus. Course is always perfectly maintained and challenging. Clubhouse, pro shop and bar are excellent. Drink carts always on the course. Practice facilities are well done with plenty of range balls provided, practice sand trap, and chipping green.